For 2019 we've decided it's a good time for PGS to start raising money for charity. We hope to make it a regular feature and sustain fundraising efforts throughout the year. To start with we're going to be fundraising for Village Water. Village Water is transforming lives in Zambia & Mozambique with safe water, sanitation & hygiene. It's a lean and transparent charity delivering highly targeted solutions that make a huge difference. Our target is to raise enough money to build a well and transform the lives of a group of people living in a rural village community. PGS Services Ltd has put in half the required amount and we're hoping that we can raise the rest before the end of April. We'll be able to follow the progress of sanitation training and construction of the well and it'll be very rewarding to see how our contributions have helped. 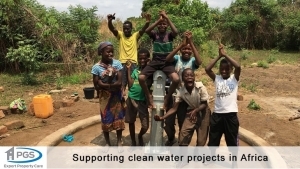 Read more about our fundraising for Village Water on our JustGiving page. Enter your details below and we'll call you back as soon as we can, usually within a few minutes during office hours. Please tick this box to confirm that you are happy to be contacted by email or telephone in relation to this request. Our customer service team is available to help with customer queries and job bookings during the following times.